Idomeneo, the King of Crete, makes a promise to the gods he cannot keep in Mozart's dramatic tale of love, jealousy, punishment and redemption, set during the Trojan War. The story follows Idomeneo, who's pledged to sacrifice the first human he meets on shore in exchange for survival at sea. But the first person he encounters turns out to be his own son Idamante, who's become a promising leader in his father's absence and who's caught in a war of affection between the Trojan princess Illia and her Greek counterpart Electra. "...Restaged here by David Kneuss, one of Ponelle's assistants, this production capitalizes for the most part on the story's dramatic intrigue, setting up telling geometric onstage interplay between Idamante's romantic rivals and effectively arraying the large chorus which portrays the citizens of Crete." 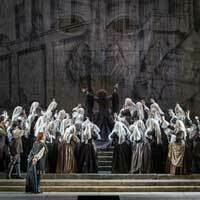 "...There is no more musically intelligent exponent of the opera�s title role now before the public than Polenzani. The Evanston native had portrayed the deeply conflicted monarch in this production last year at the Met (it was nationally televised), and he was in equally resplendent form on this occasion, excelling in both his impeccably stylish legato phrasing and firm martial declamation without ever compromising his agility; all three qualities were impressively on display in Idomeneo�s Act 2 �Fuor del mar,� one of Mozart�s most supremely demanding tenor arias, full of coloratura twists and turns that Polenzani dispatched thrillingly." "...Mozart tinkered with Idomeneo more than once during his short life, rewriting parts and cutting arias, and it shows in the unevenness of the version presented here at Lyric. The dated production design and numerous role debuts contribute to the inconsistency. Nevertheless, between Brugger�s eminently lovable Ilia, Mozart�s stunning music, and the libretto�s classical theme, Idomeneo is not to be missed." "...Musically, it�s superb, especially Idomeneo�s centerpiece aria in Act Two. Weighty, but not grandiloquent. Dramatically, let�s say librettist Giambattista Varesco was no Lorenzo da Ponte. Varesco takes his sweet time introducing the conflict, much less bringing everything to a boil. Its content approaches three hours in length and still requires a program note to relay exposition. Also, perhaps owing to the opera�s origins as a commission for a court carnival, there�s a happy ending that seems a little out of character on the part of the ill-tempered sea god."